There's just something about cleaning - maybe it's the little scratches on the wood floor, that I saw, while cleaning and polishing them or the hall bathroom, that still needs painting. Or that messy garage, that has boxes full of knik knaks, that I stored while we painted. I miss them! 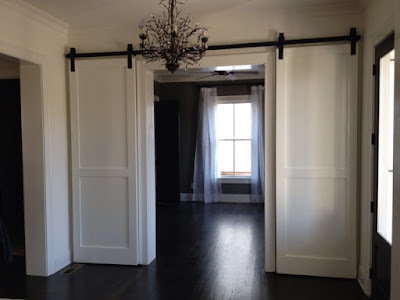 So, anyway, I was looking at my sliding closet doors in the hall, which are the basic sliding doors. 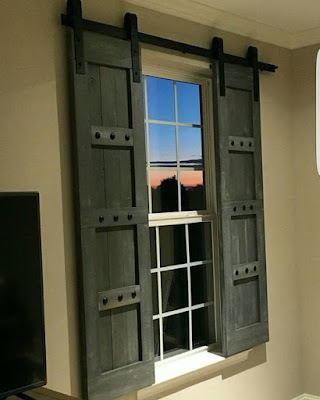 I don't care for them and it's not like I am prepared to do this soon but was just wondering how it would look if I went for a faux barn-door look for the sliding doors. I like the first photo - easy! I don't have the clearance to actually have a barn-door, anywhere in my house. Bummer! This actually looks similar to my hall. My dining room would be to the right. 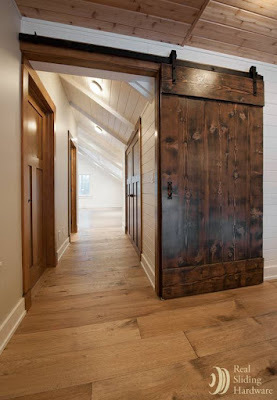 I'd love to have a door like this, but would have to make clearance and that would mean, getting rid of a favorite piece of furniture for the barn door. 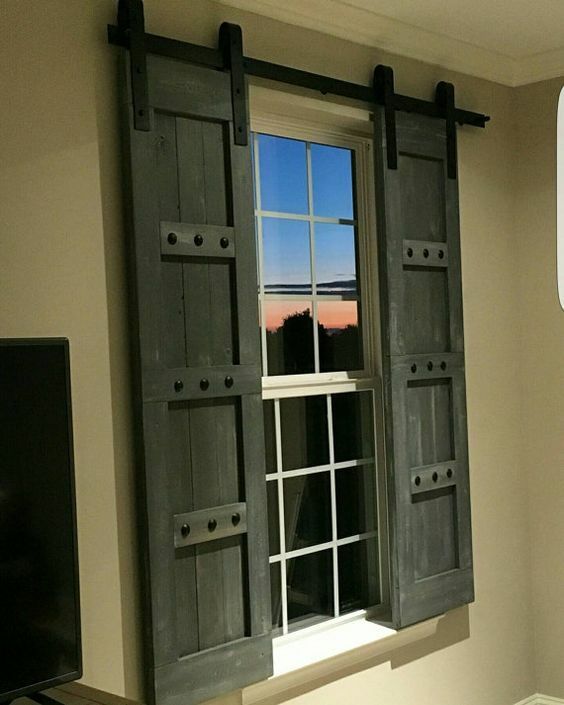 I like this for exterior windows - barn door-type shutters. Reminds me of the Western TV show in the late 60's, The High Chaparral. This is gorgeous. I like everything about this room. 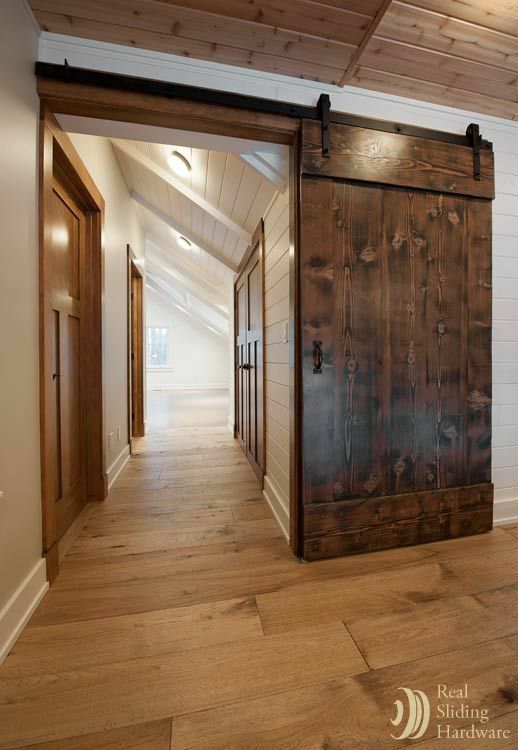 The dark hardwood floor, the chandelier, and the doors that enter into a living room or study. I've spent too much time, dreaming - NEED to get back to cleaning and getting everything ready for tomorrow. Have a Blessed Thanksgiving. 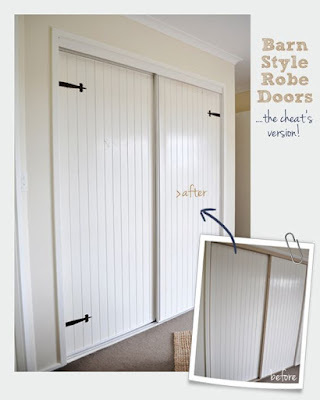 I love the look of barn doors. Not sure how I would accommodate them in my house though. Yeah they do take up some valuable wall space - but they look so cool.